Reading static data from local array. Let us create a data source by reading data from local array. In above case source of an image can be set as following. SpeakerPhoto and SpeakerName are properties of data array. To create ListView you need to set data-role attribute of <ul> element as listview. To define how data should be displayed in the ListView set data-template attribute and data source can defined by setting data-source attribute. 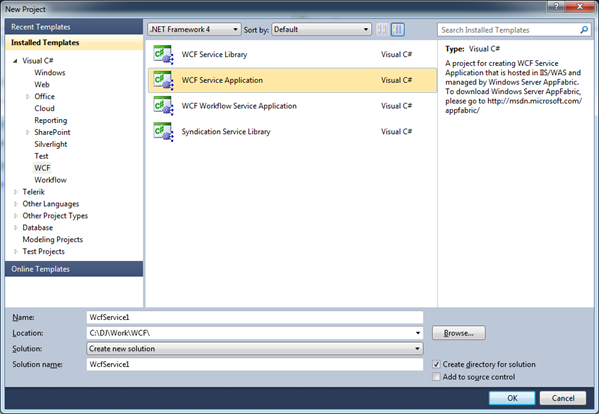 In this post we will walkthrough on consuming WCF REST Service in Kendo UI Mobile. We may consider this post is divided in two parts. In part 1, we will see the way to create REST based WCF service and in part2 of this post we will consume that REST Service in Kendo UI mobile. If you are new to WCF and wondering how to create WCF REST Service .Please read many articles on WCF REST Service here . To get it started quickly fire visual studio and create a new project. From WCF tab select WCF Service Application project template. Delete all the codes generated from both the IService1.cs and Service1.svc.cs file. Although in this post we are not going to fetch and data from database. We will return C sharp collection as data from WCF REST Service. However we can use any methodologies to create data model and expose data from data model as service. To make it simple we are going to work with following business object. If you notice we have explicitly set the Request and Response message format as Json. Service is implemented as following. There is not much fancy about the service implementation, it is simply creating collection of business object and returning. Next we need to configure Endpoint. Rather than creating Endpoint we are going to use factory class. Class System.ServiceModel.Activation.WebServiceHostFactory enables REST Endpoint on WCF Service. To set factory class right click on Service1.svc and click on view markup. In markup add factory class as following. After configuring factory class we are all set with WCF REST Service. To test the service, run the service in browser. We should be getting Bloggers information as JSON data in browser. Once you get data in browser (if you are using IE then you will be prompted to save returned data), we are all set to consume this data in Kendo UI Mobile. 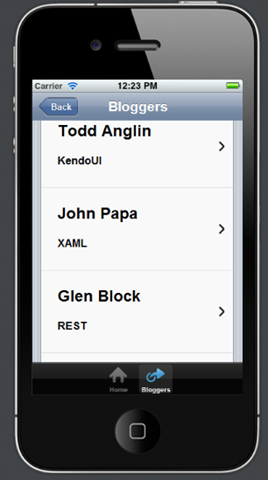 Very first add the required references to work with Kendo UI Mobile. You need to add reference in head section of the page. After adding references we need to initialize the mobile. To do this adds below script just before the closing body tag. You can see that layout and transition has been set. We will create layout in next step. Next we need to create different views. 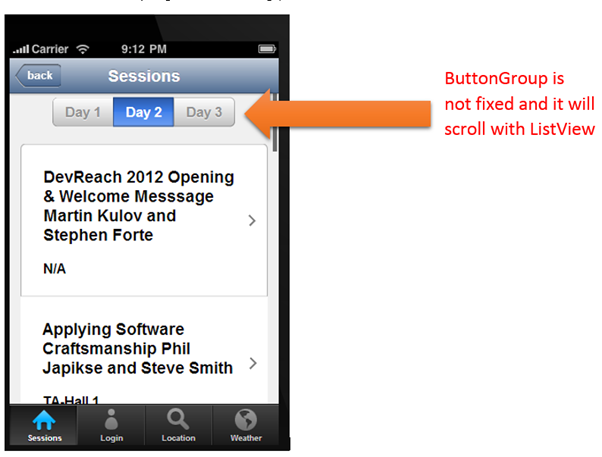 As you notice from layout that we need to create two views. One is homeView and other bloggerView. In homeView we will display a message. Now we need to create bloggerView. 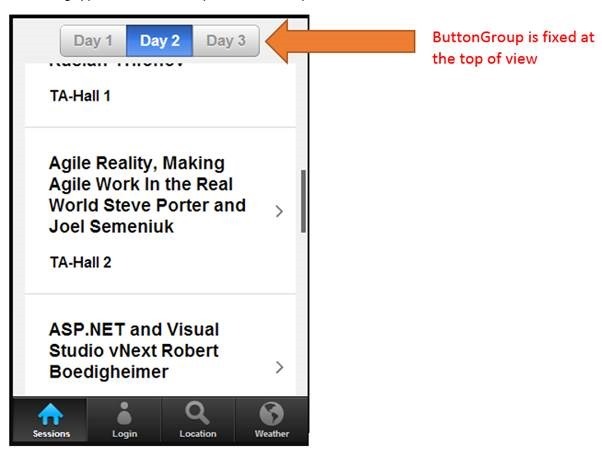 In this view we will put a Kendo UI Mobile ListView control. 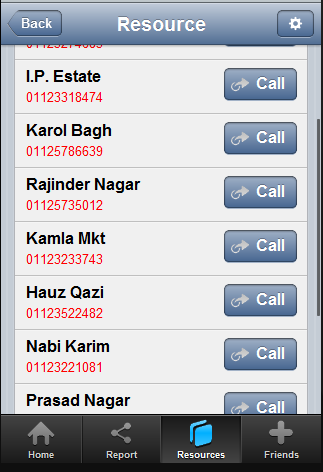 All the data returned from service will be bind to this ListView. Data Template allows us to render data as we want. It is used to format the displaying of data. A template can be created as following. We are creating a Kendo UI list view link button and displaying Name and Technology of the blogger. 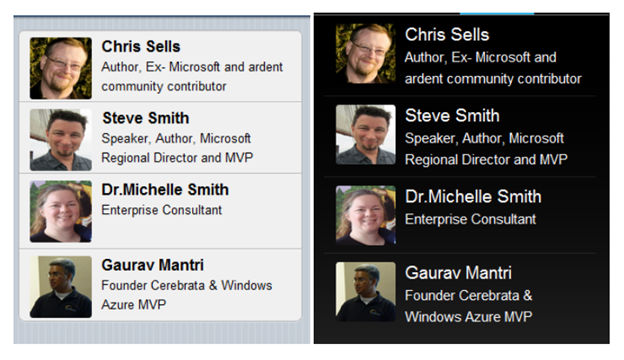 Id of this template is set as data-template property of list bloggerList. Now we need to create datasource. We are going to create Kendo UI DataSource reading JSON data from the service. In Kendo UI DataSource configuration, read attribute has been set to the URL of the WCF REST Service. Since service is retuning JSON data hence Accept type is as application/json. Finally in data-show method of view we will fetch data from the DataSource. If you notice data-show attribute of bloggerView is set to showBloggers. 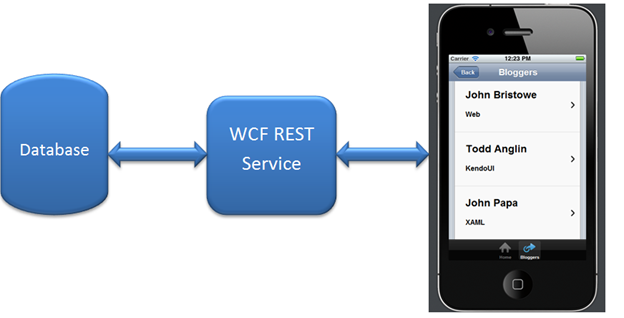 In this way you can consumed a JSON based WCF REST Service in Kendo UI mobile. I hope you find this post useful. Thanks for reading.